Locative app to explore the historic village of Lacock available on App Store. As you walk around the village you will hear stories linked to items from the estate archive triggered by the GPS. 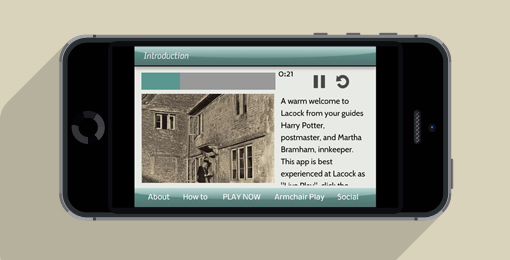 I have been working on the app for Creative Wiltshire, and it is part of Wiltshire and Swindon History Centre’s Lacock Unlocked project. The archive was saved for the nation by a Heritage Lottery Fund grant and the app offers an innovative form of interpretation for it. Items include the illustrated 16th century Royal pardon for the first owner of the Abbey at the heart of the village through to more recent accounts of the treatment of the village poor and propaganda photographs taken during the Second World War. These all form the basis for stories you will hear as you walk the village.